Dalton Smith, a senior from Spring Hill, is using his last year at the University of Tennessee at Martin to gain hands-on experience in wildlife research through the tracking of 12 raccoons on and around the UT Martin campus. The raccoons, who wear radio collars, are located each week using a method called telemetry. To locate each animal, Smith uses a one-way radio antennae and a receiver to listen for the unique radio frequency from its collar. He takes readings from at least three locations, and wherever his data lines cross is the likely location of the animal at that moment. 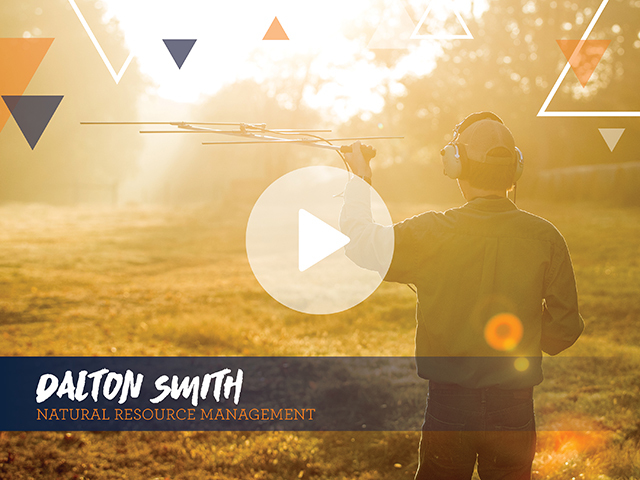 This project, which began in the late summer of 2016, not only gives Smith an experience he needs to stand out in graduate school, but will also provide information useful to farmers and wildlife managers in the area. Smith hopes to attend graduate school after graduating from UT Martin this spring and plans to become a wildlife biologist. He is particularly interested in working with ducks and geese, and has applied to research assistantships through South Dakota State University and Auburn University. “I think doing undergraduate research really (puts) you ahead when you’re going to grad school or starting your career,” said Smith. He encourages his fellow students to find a project they are passionate about and make it a learning experience as well.